Well here it is the 24th March and all but two chapters are written. I’m just being slow about these two because I’m fiddling with the layout, adding photos and taking my time. 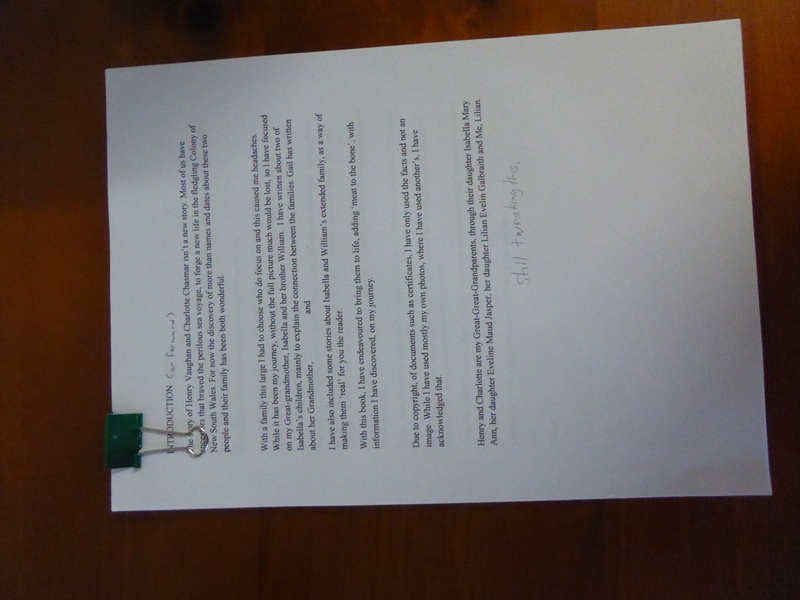 I sent 90% of the manuscript to be edited, last Monday and today took a B5 copy to my daughter. She is going to correct any mistakes and send it back. I’m going to use Lulu to publish the book. This way people can order their own copy and I wont be stuck with unsold books. Lulu is an online publishing house, https://www.lulu.com/ I’ve got both the A4 and A5 templates and will see which one looks best. I’ve had a fantastic time expanding my knowledge of various topics, from the Bubonic Plague, Old Sydney Maps, types of sailing ships to Masonic Lodges. It is interesting to see what the family did and where they lived. Will update, as I do more. Just before I posted it off to be edited. « Writing a Book. » Two interesting websites.